(Central Islip, N.Y., April 20, 2015) – The three-time Atlantic League champion Long Island Ducks today announced that outfielder Trayvon Robinson has been signed by the Arizona Diamondbacks organization. He will report to the team’s Triple-A affiliate in Reno, Nevada. Robinson is the first 2015 Atlantic Leaguer to be signed by an MLB club, and the Ducks’ 73rd player signed by MLB all-time. 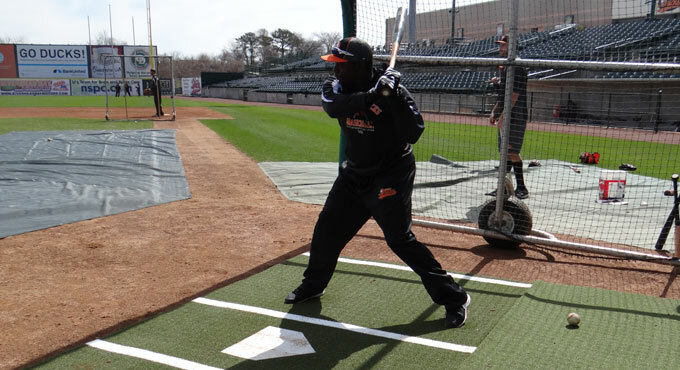 Robinson appeared in both of the Ducks’ Spring Training victories over the Bridgeport Bluefish this past weekend. On Saturday at Bethpage Ballpark, he drew a walk in four plate appearances. The following day in Bridgeport, he picked up a single in four at-bats. The Los Angeles native was signed by the Ducks on April 13. The former Major Leaguer reached the game’s highest level with the Seattle Mariners in 2011 and 2012. Over 90 games, he compiled five home runs, 26 RBI, 28 runs, 16 doubles and seven stolen bases. The 27-year-old has played 10 seasons of professional baseball and spent the entire 2014 season with Triple-A Albuquerque in the Los Angeles Dodgers organization. He was named an All-Star in three consecutive seasons (2009-11) as well as an MiLB.com Organization All-Star with the Dodgers in 2010. Robinson was originally drafted by the Dodgers in the 10th round of the 2005 amateur draft.